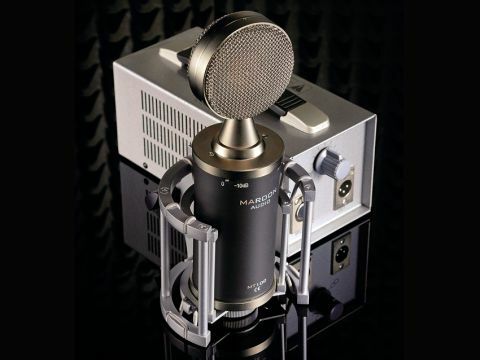 An impressive looking and sounding mic with versatile strengths at a competitive price. Great vocal sounds. Wide tonal variation. Value for money. Not great for bass. Some mounting issues. The Maroon Audio MT100 is an impressive looking microphone. With its striking retro design that's reminiscent of the Neumann CMV263 and big chunky cradle you need a substantial mic stand to support it. The finish is very good and it certainly drew some admiring glances around the studio. Our first little gripe is that you really have to put some effort into tightening the nut on the mount as it does have a tendency to tip forward. Maroon Audio assures us that it's are looking into this so hopefully it's just a teething problem. The power supply is equally retro in design and connects to the mic using the supplied 7-pin XLR cable. Unlike many multi-pattern microphones the MT100 has polar switching on the power supply (which is where it should be) leaving the body of the mic with only two switches for the 10dB pad and the bass rolloff. The pattern control is a stepped 9-position pot going from omni through cardioid to figure-of-eight. When testing the polar patterns the omni setting seemed strange. The two sides of the mic sound quite different and the side rejection is far more than we would expect. That said, it was more omni than the other settings. Running the mic through our Focusrite ISA215 set flat we recorded a few different acoustic guitars, some percussion and a couple of different voices. Experimenting with polar patterns and positions, it's possible to get some great variations of tone without ever resorting to EQ. "In front of a guitar amp the MT100 sounds really lovely, particularly on cleaner sounds where you need to hear the detail." The subtleties of each instrument come through well and, despite everything being recorded with one mic, it's easy to get balance and perspective into the track. On trying the mic on a bass drum and upright bass we were a bit disappointed. We missed some real low end so things ended up sounding a little boxy. However, putting it out in the room and giving it some serious compression we got some great drum ambience which was particularly fine on figure-of-eight. In front of a guitar amp the MT100 sounds really lovely, particularly on cleaner sounds where you need to hear the detail. Using the pattern switching as we had when recording the acoustics and voices it gave us plenty of tonal variation so it was simple to find a setting that sat in the mix. Although Maroon is a UK-based company, manufacturing is done in China. The build quality is certainly at the better end of the Chinese mics that we have seen and electronically it's very quiet with a decent output level. On a purely cosmetic level, any musician you put this in front of will feel important. Despite its poor showing in the bass department this is a very good and versatile mic. Switching patterns gives a bigger sound change than with a lot of large capsule condensers but it works to Maroon's advantage. You can get some lovely warm vocal and acoustic guitar sounds and plenty of bite with electric guitars, too. Percussion comes out crisp and clear with good depth. This is a great valve mic for those on a budget.